Animals: Learn to Draw 75 Animals in Ten Easy Steps! Walter Foster Publishing, 9781633224889, 128pp. 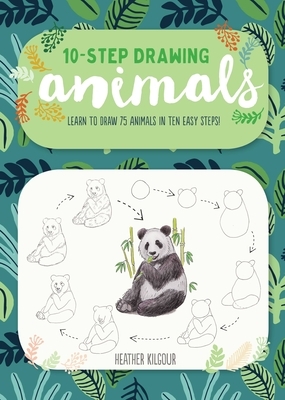 Featuring illustrated tutorials for drawing 75 different animals, Ten-Step Drawing: Animals breaks down each subject into 10 simple steps. All you need to get started is a pen or pencil and a piece of paper! With Ten-Step Drawing: Animals, you will learn to create an awe-inspiring array of different animals. Step by step, you will create creatures both wild (bald eagle, armadillo, meerkat, dung beetle) and domesticated (donkey, camel, duck, goat). The animals include those from the sea (whale, sea turtle, jellyfish, walrus) and the woodland (snail, fox, raccoon, river otter). Even learn to draw your favorite pets (cat, dog, rabbit, guinea pig). Handy prompts encourage artistic individuality, and include helpful tips for drawing other subjects not featured in the book. Ten-Step Drawing: Animals is sure to encourage even the most reluctant amateur artist to draw their heart out. Heather Kilgour is a London-based illustrator who specializes in children's books. Heather was the featured illustrator for Words & Pictures online magazine and is a member of the Society of Children's Book Writers and Illustrators' Illustration Committee. Learn more at http://heatherkilgour.com.